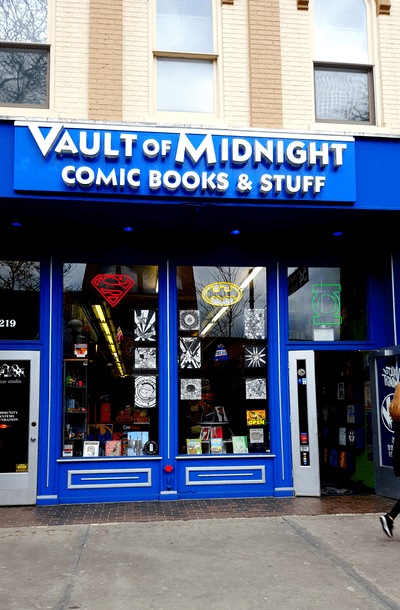 On South Main Street near the Liberty intersection is a heaven for comic book lovers, the wonderfully named Vault of Midnight. I first visited the store in March when my anime loving 14-year-old and her friend declared the store a must see on a trip across the border over the spring break. They’d found reviews of the store on Yelp and noted that the store hosts anime movies on Wednesday nights at an off-site location (for a limited run). While unable to take in the anime movie, my daughter and her friend spent time browsing the large collection of anime novels. Vault of Midnight isn’t a large store. The customer space is likely 5,000 square feet in total but it is extremely well laid out. Shelves line the walls and shorter shelves create a center aisle ideal for browsing comic lovers to have a sense of peace in their perusal. I spoke with a very friendly and helpful store employee named Liz. She told me that Vault of Midnight has been in business for 10 years (though not at this location). Vault of Midnight is also open in Grand Rapids and a third location opened this week in Detroit’s downtown core. 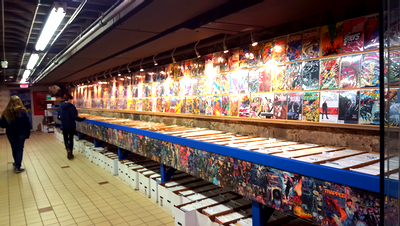 The store offers a popular subscription program that allows comic lovers to automatically receive new issues of their favorite series. For readers who prefer to browse, never fear, the lower floor of the store is a paradise for people seeking that special issue. Vault of Midnight has something for everyone. Fans will find models, tee-shirts, games, stuffed animals, vibrant figurines, collectibles and more. This Whovian managed to find items to make me melt a little. By the end of the visit, both of my young companions, each in full possession of birthday money, had spent nearly everything they had. I asked Liz if she’s noticed a jump in anime sales with a growing popularity with a middle-grade audience. She said that as anime has always been very popular, she had not noticed a jump in sales. Still, I couldn’t help but notice the large number of 12-14-year-olds that enter the store during our visit. Vault of Midnight is a fun and funky store in a wonderful walking neighborhood. While street parking is available, I suggest parking in the structure two blocks down across from the courthouse and walking to the store to absorb the people and atmosphere of downtown Ann Arbor. 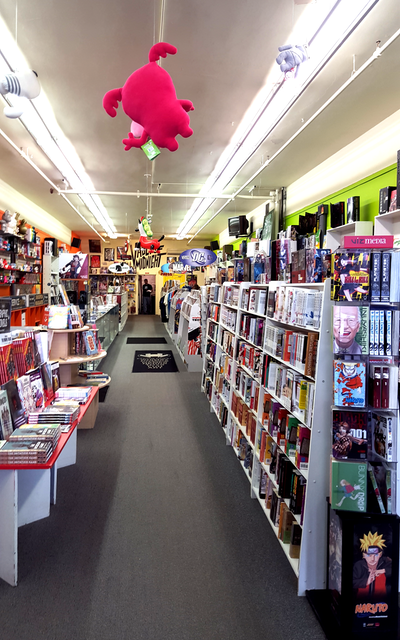 Vault of Midnight is a wonderful comic book store run by wonderful people. If you’re a comic book lover, give them a try and if you’re someone looking for something to do on a gorgeous Friday, be sure to stop by. While in the area, take the opportunity to stop by Jerusalem Garden on East Liberty for some great and reasonably priced food.